Two weeks ago, we showed how to construct a customer profile. For a startup, one of the most important reasons to create a customer profile is to use it to formulate a value proposition hypothesis, the heart of developing product/market fit. 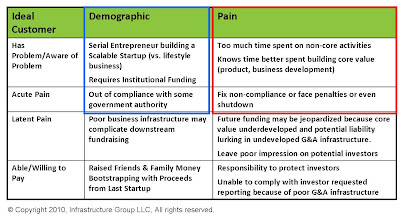 We create a new table (Table 2) with pain on the left, value proposition hypothesis in the middle, and product/service on the right. Initially, the value hypothesis is an unvalidated best guess. 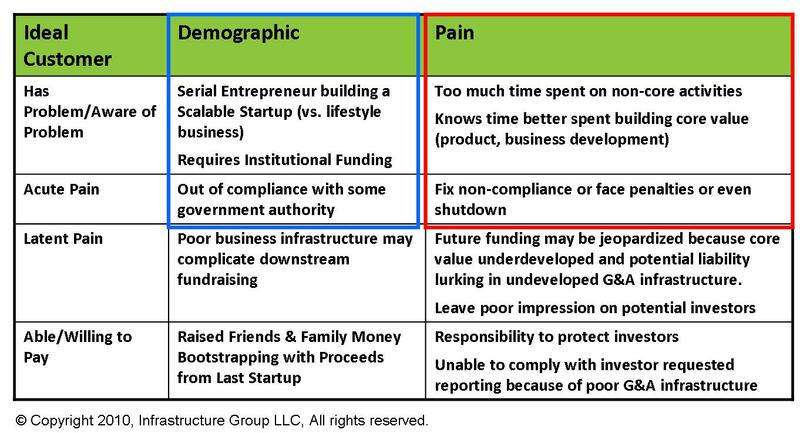 This needs to be validated in discussions with target customers fitting the demographic column (highlighted in blue in Table 1) of our customer profile. 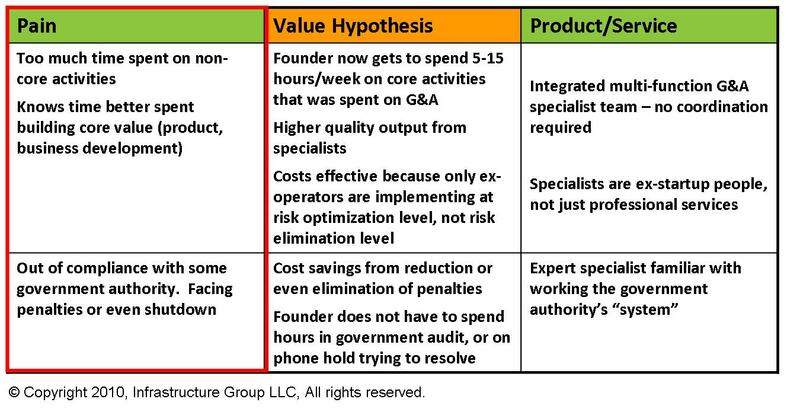 As we iterate over time, the middle column can be changed from value hypothesis to value proposition. Note that the value hypothesis describes the benefit derived by the customer in relieving the pain. Ideally, this should be quantifiable. Value hypotheses usually tie back to increased sales, increased speed, decreased cost, improved performance, or improvement in quality. 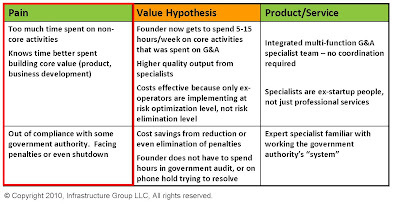 The far right column shows the product feature hypothesis (i.e. the specific product or service) we are offering to deliver on the value proposition. This too need to be validated in discussions with target customers as to whether these product features actually deliver the value the customer wants. Whether as part of the hypothesis validation process or for sales execution, the customer profile is the starting point for qualifying leads. To illustrate, focusing on just the two demographic points highlighted in blue in Table 1 we create a new table (Table 3) with questions we can use as part of a qualification script in the middle column and information learned or actions to take listed on the right. A good lead qualification script should shunt a raw prospect into the appropriate customer profile among multiple profiles or completely out of the sales process. 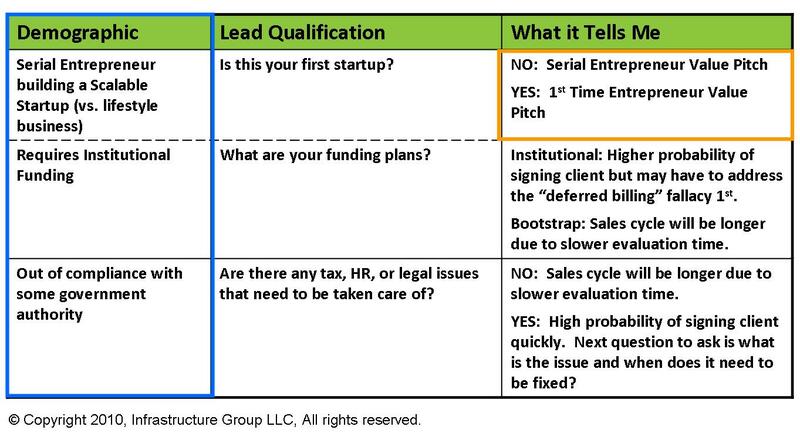 What I've skipped in this example is that we actually have several different customer profiles of which I'm only showing two (highlighted in orange in Table 3) called "serial entrepreneur" and "1st time entrepreneur". If a raw prospect fits none of our profiles, it means that they are either not a fit or we potentially have a new customer type that requires further profiling. I'm not going to cover the creation of lead generation scripts here. But typically it's a flowchart with subsequent questions or action determined by the answer to prior qualifying questions. One of the fundamental premises behind marketing strategy and positioning is the concept that markets can be segmented. The better your segmentation, the better you can target your offering which if executed properly should enable you to dominate your segment better than competitors who do this less effectively. That's the theory. One practical implication of this is in the area of sales resourcing and forecasting using the classic sales funnel. To see how this works, Table 4 shows a simplified comparison of the sales funnels created from the two profiles highlighted in orange in Table 3. Note that based on our customer profile and our understanding of each type's pain, we have two different value propositions. And in the case of 1st time entrepreneurs, we know that we likely have an additional step - education - not necessary with serial entrepreneurs and that that step has a fairly low yield rate. This means that we know that to close the same number of new clients we have to talk to seven times as many 1st time entrepreneurs as serial entrepreneurs (30:4 ratio) and that it takes longer as well. This has obvious implications about where we target our sales time and resources, what resources we use, and how we use them. Customer profiles: don't go to market without 'em.